What is the TFCC? How do you Treat it? This is part 2 of a series on assessing and treating TFCC injuries. Read part 1 here. After a patient’s wrist has been assessed and it is determined that there is a TFCC lesion, tear, or injury present, the surgeon determines whether to pursue surgical intervention or conservative treatment. The intervention selected by the surgeon impacts the role and strategies that the rehab clinicians use to restore the patient to normal functioning. In this article, we will review both conservative and post-surgical treatment approaches for clinicians treating patients with TFCC injuries. As with many injuries or conditions, the ideal option is to treat TFCC injuries conservatively to avoid unnecessary surgery. Conservative treatment is thought be ineffective for chronic TFCC lesions or tears, meaning that the tear or injury is older than 6 months  . Understanding this, conservative treatment is likely most effective for type 1 TFCC tears or lesions, provided that treatment is initiated within 6 months of injury. Check out Part 1 to read about the types of TFCC tears and their mechanisms of injury. Since type 2 TFCC lesions are degenerative, treatment tends to be initiated after some time of persistent pain or dysfunction. This limits the effectiveness of conservative treatment . There are no given or set timelines for each stage, and clinicians must use clinical judgement when deciding when to progress or hold a patient at a given stage. Let’s take a look at each of these phases in a little more detail. When initiating conservative treatment for the TFCC, clinicians must take appropriate steps to reduce the irritation, pain, and inflammation at the wrist . 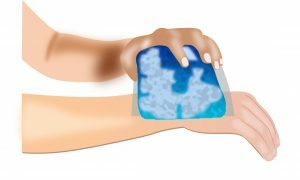 Ice can be used to help alleviate pain and inflammation at the wrist. The surgeon or other primary care provider may instruct the patient on a course of NSAIDs during this time as well. During this time, the clinician should instruct the client or patient to avoid any aggravating activities that may cause increased pain or inflammation. This activities may include movements that involve resisted supination/pronation, ulnar deviation, or strong gripping . While it is important to have the patient or client avoid aggravating activities involving the wrist, clinicians must ensure that the patient or client is instructed to continue movement of the uninvolved joints such as the shoulder, elbow, thumb, and fingers. 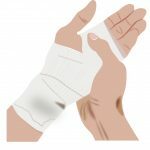 Depending on the how recently the injury occurred, or how irritable and inflamed the region around the TFCC is, splinting or immobilization may be indicated. The time recommendations for splinting vary, but is usually between 3-6 weeks  . The main components of this first phase of the rehab process are rest/immobilization, ice and NSAIDs to control inflammation, PROM and maintenance exercises, as well as patient education. Following the immediate pain management and inflammation control phase, clinicians turn their focus to restoring normal range of motion. The wrist and fingers/thumb should be the main focus of this phase, assuming that the patient or client has followed the exercise program prescribed for the shoulder and elbow during the previous stage. 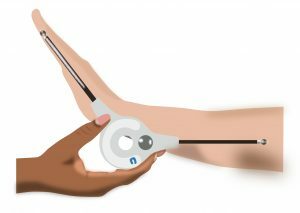 Depending on the time of immobilization and any apprehension that the patient or client may have about movement of the wrist, the clinician may begin with some manual techniques aimed massage, low level glides, or soft tissue mobilizations  . The goal in this stage is to progress from passive range of motion (PROM), to active-assistive range of motion (AAROM), to full active range of motion (AROM). A removable wrist splint may still be worn occasionally during this phase for additional protection. 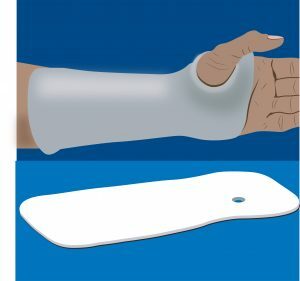 The splint wear schedule for this phase typically involves PRN wear (as needed) during work or functional tasks and possibly at night . Once normal ROM has been restored, the patient or client can then be progressed to the next stage of the rehab process: strengthening  . A general rule when rehabbing any joint is that clinicians should aim to restore full ROM before initiating strengthening of that joint (I’m sure you all heard “motion before strength” a time or two during school and clinical rotations). The same remains true during rehabilitation of TFCC injuries . As range of motion returns to normal, the clinician progresses exercises into strengthening. The load on the wrist is progressively increased, ensuring appropriate motor patterns and limiting compensatory patterns. 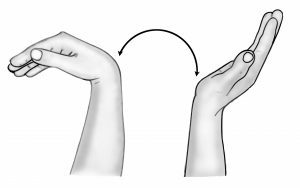 The wrist and digit exercises from the previous section can be continued, while increasing the load and repetitions as tolerated . During this time, patient education focuses on injury prevention, return to function, and (if applicable) work or job-specific techniques. Because there are countless situations and circumstances surrounding return-to-work, it is important for the clinician to maintain an open line of communication with the client or patient as well as the supervision doctor or surgeon. Rehabilitation clinicians will have to draw from their clinical expertise, patient/client factors, unique job demands, and doctor recommendations when establishing a return-to-work plan for a patient or client. Typically, conservative treatment should result in decreasing symptoms and improving function within 4-6 weeks following the immobilization period. If after that time, the patient’s symptoms and limitations persist, discussion of surgical repair or debridement may be considered . At that point, the clinician can refer the patient or client back to the referring physician for further evaluation and assessment. If conservative treatment fails, or if the supervision physician thinks it a better immediate option, there are options for surgical intervention and repair of the TFCC. There are two different types of TFCC repairs: a centra debridement or a peripheral repair . The repair technique selected depends on the type of TFCC lesion, level of dysfunction, and other complicating factors. Because 80% of the central TFCC —the articular disc— is avascular, it has a poor ability to heal. Damage to this area of the TFCC typically results in a lesion or tear that is treated by debridement. Debridement refers to the removal of damaged tissue or foreign objects from a wound or wounded area. For TFCC repairs, a central debridement is when the surgeon removes the damaged tissue from the central portion of the TFCC. This surgery can be completed either arthroscopically or via open incision . Given that the central portion of the TFCC and its articular disc are more susceptible to degenerative damage, central debridement is a common treatment for type II TFCC lesions (those occurring from chronic overuse or degeneration) . When the ligaments of the TFCC are torn, a central debridement is not the surgery of choice. In this case, the surgeon may opt for a peripheral repair. 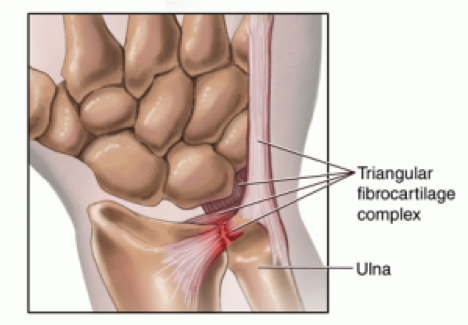 In this surgical procedure, the radioulnar ligaments (RUL) of the TFCC are actually repaired  . As opposed to a central debridement, a peripheral repair typically involves an open incision, to allow access to the TFCC during the surgery. If there is an avulsed portion of the TFCC present, it will be debrided, and the torn border of the ligament is sutured into place . 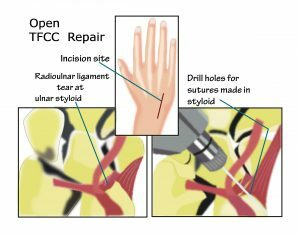 In some cases, the surgeon may also opt to do an ulnar shortening osteotomy along with the TFCC repair. In this case, the surgeon cuts out (excises) a distal segment of the ulna. The goal is to decrease any ulnar variance that may be present to decrease the risk of continued pain or complications that may result from the lack of space between the ulna and the carpal bones . As we will discuss below, the overall concepts for rehabilitation following TFCC repairs remain the same, however there are slight differences in the treatment protocols depending on which type of surgery a patient or client undergoes. Following surgical repair of the TFCC, rehabilitation follows a protocol established by the surgeon. While most repairs will follow the timelines on these protocols almost exactly, it is important to keep an open line of communication with the surgeon to ensure compliance during the rehab process. Depending on what was found during surgery, any complicating factors, or any additional injuries, some timelines for healing and rehabilitation will change . For the most part, the therapist, patient, and surgeon should expect the patient to return to normal activities (work, sport, leisure) between four (4) and eight (8) weeks after surgery . Below we will review some key concepts for rehabilitation following TFCC repairs, appropriate outcome measures, and a general 4-phase rehabilitation protocol for both central debridements and peripheral repairs of the TFCC. As with any other surgical repair, the aim of the first few days or weeks after surgery are aimed at protecting the repair to ensure optimal outcomes down the line. Wound care, scar management, edema control, and splinting are all important during the initial phases the rehabilitation process following a TFCC repair. Following the initial, protective stages of recovery, initiation of range of motion and restoring normal movement is followed by progressive strengthening and a return to normal activities. It is important that the therapist maintains an open line of communication with the surgeon throughout the rehabilitation process to make sure that all recommendations, precautions, and goals are being adhered to and met in a timely fashion  . 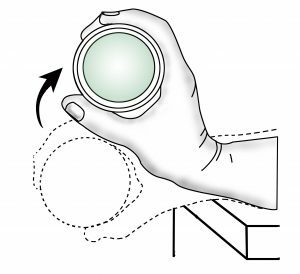 Since the patient’s wrist will likely have been immobilized for a period of time during conservative treatment —and definitely after surgery— an objective outcome measure like ROM measurements using a goniometer can show realized improvement in overall movement of the wrist. The same is true of functional grip strength. Long periods of immobilization and disuse cause the hand to get weak, so it it important to have a way to document improvements in grip strength. The quickDASH outcome measure is great because it is standardized and has age-related norms associated with it. This makes it a good tool for both measuring outcomes, assessing current level of function, and setting specific goals for a client or patient. Whichever outcome measures are chosen should be replicable, consistent, and accurate in order to appropriately document gains and progression during rehabilitation. Here is a basic rehabilitation protocol following a central debridement of the TFCC  . The Diagnosis & Treatment Manual for Physicians & Therapists published by the Indiana Hand to Shoulder Center (which can be found here) also provides evidence-based guidelines and protocols for TFCC injuries and repairs. The days in parentheses indicate at what point post-operatevly to begin that phase (rough time lines). Again, it is important to keep an open line of communication with the referring physician to make sure that rehabilitation is following the protocol and precautions that he/she wishes be followed. Use this protocol as a reference, but always double-check with the referring physician. Below is a basic post-operative rehabilitation protocol for a peripheral repair of a TFCC  . It is important to understand that the goal of surgery is to decrease pain at the wrist. Because of this, any aggressive PROM or strengthening that increases wrist pain is contraindicated (don’t do it!). Increasing ulnar-sided wrist pain should be avoided, though it is appropriate to have the patient or client work through pain associated with wrist stiffness or extrinsic muscle tightness . As always, maintain an open line of communication with the supervision physician to ensure that therapy remains in compliance with all protocols and precautions. Of Note: Sometimes the surgeon elects to do an ulnar-shortening in conjunction with a peripheral TFCC repair. In this case, the rehab protocol is altered and the therapists should obtain guidance from the physician before initiating any therapeutic interventions. The TFCC and the DRUJ are anatomically complex and effective treatment, bot conservatively and post-operatively. Effectively treating TFCC injuries requires the therapist or clinician to have a thorough understanding of the anatomy, biomechanics, and differing rehabilitation protocols. It can never be overstated the importance of maintaining open lines of communication with the referring physician, especially in post-operative cases where there may be other complications or surgical procedures completed (ie. ulnar shortening). Have you treated patients who have had TFCC repairs or some other DRUJ dysfunction? Share any additional resources that you found helpful in the comments below! For more informational reads, check out our Blog to see all the articles we’ve published to date. Click here to head over to our resources section and check out our variety of clinical and professional resources aimed at increasing your knowledge and skills. We have many free and inexpensive resources, like our report on Total Shoulder Replacements or our Core-4 Shoulder Exercise Program. Rafael E. Salazar II, MHS, OTR/L is the president and CEO of Rehab U Practice Solutions. He has experience in a variety of rehab settings, working with patients recovering from a variety of injuries and surgeries. He worked as the lead clinician in an outpatient specialty clinic at his local VA Medical center. He also has experience as an adjunct faculty instructor at Augusta University’s Occupational Therapy Program, as a Licensed Board Member on the GA State OT Board, has served on several committees for the national OT Board (NBCOT), and as a consultant for the State of Georgia. Read his full bio Here. Read about Rehab U Here. Sign up to get the latest articles and resources! Productivity, Can We Forget About It Already? What is the TFCC? How do you Treat it? - Rehab U on What is the TFCC? How do you Assess it?